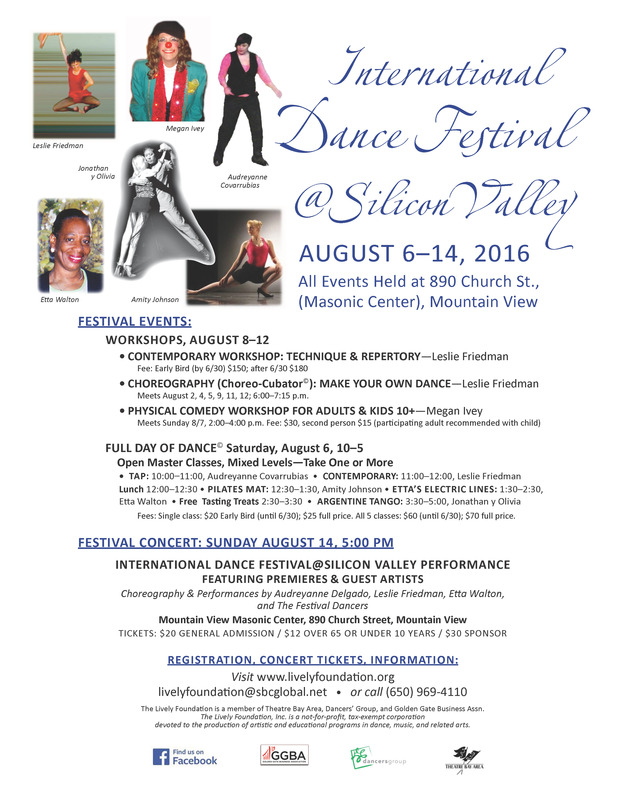 International Dance Festival@Silicon Valley: Posters! 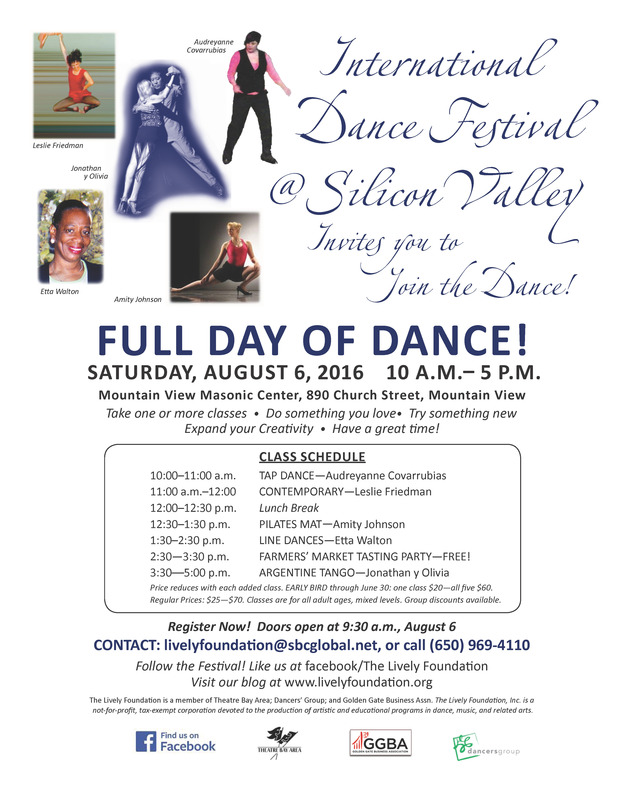 There are four wonderful poster/flyers for IDF@SV 2016. The beautifully designed, informative pages were created by Lively Foundation Designer, Jonathan Clark. Here they are: #1) includes all the Festival events, #2) Full Day of Dance©, #3) Physical Comedy Workshop, #4) Contemporary Tech & Rep Workshop. 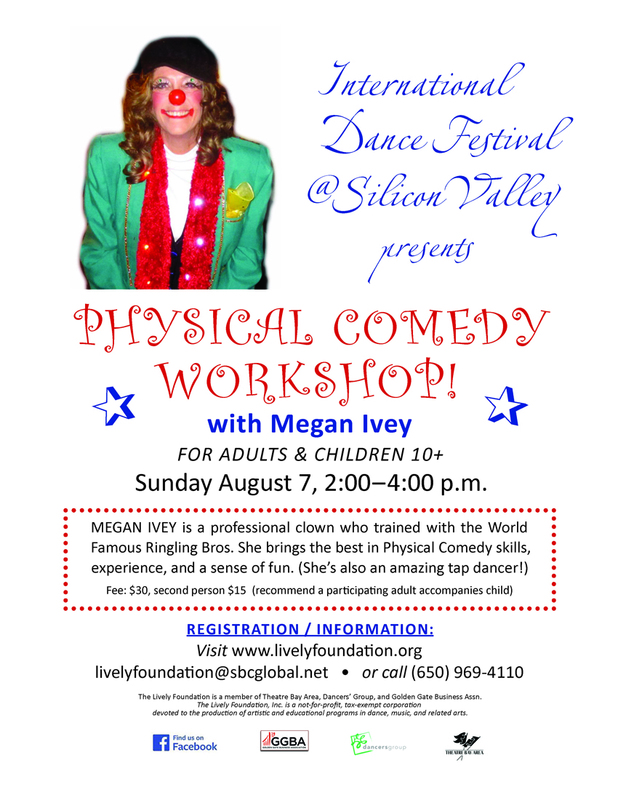 Please share the information with all your friends and friendly strangers, your dancer pals and those who think they can’t dance (bring them to Full Day, and they will surprise themselves!!). This one has schedules, fees, descriptions of events. 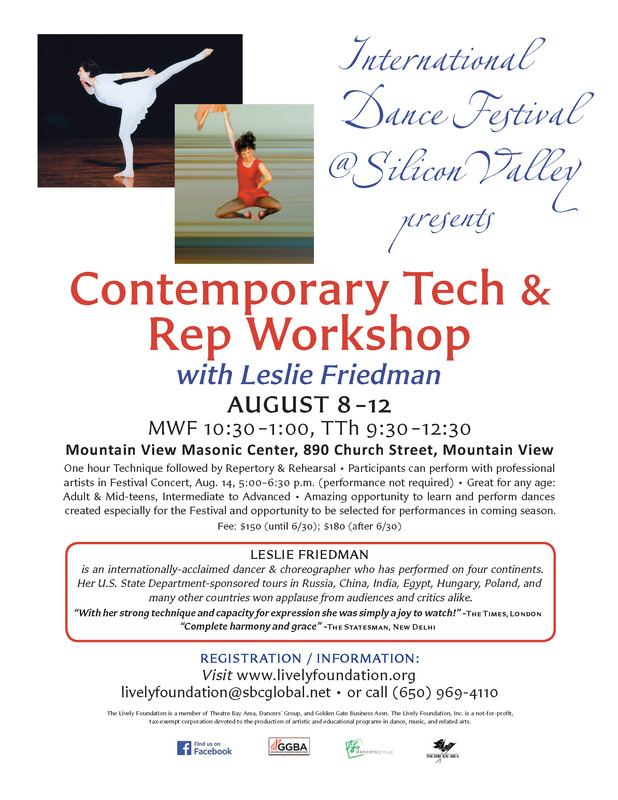 Choreo-Cubator© workshop begins Aug. 2, 4, 5 before full Festival opens on Aug. 6. 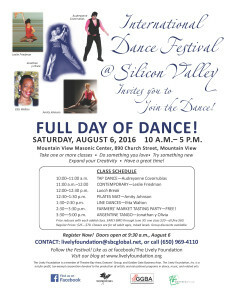 FULL DAY OF DANCE!© Best deal & most fun: take them ALL! 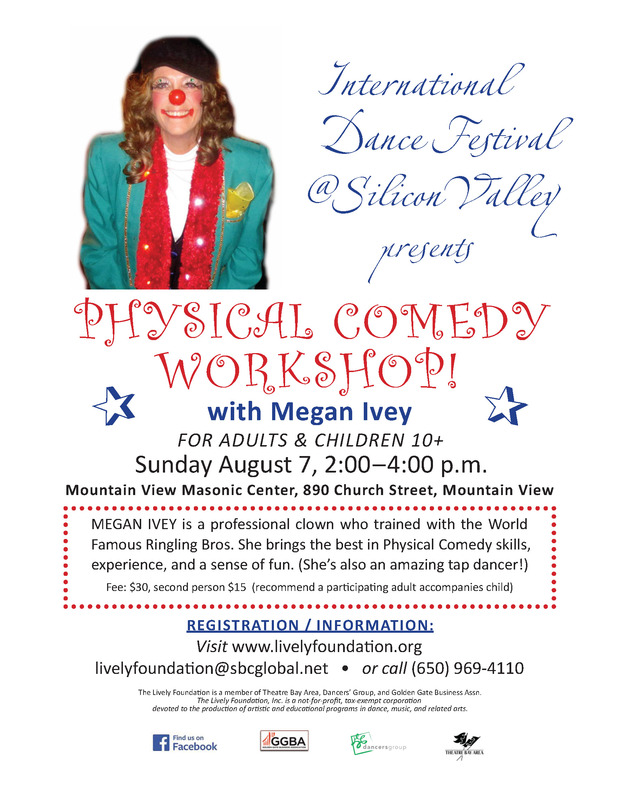 PHYSICAL COMEDY WORKSHOP: WOW! great for any age adult and younger people age 10 and up. So much fun, you have to do it! 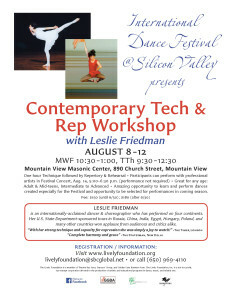 This entry was posted in INTERNATIONAL DANCE FESTIVAL-SILICON VALLEY and tagged Amity Johnson Pilates mat class, Audreyanne Delgado-Covarrubias Tap Dance Class, Choreo-cubator©, Etta Walton Line Dances, Full Day of Dance, IDF@SV 2016, international dance festival@silicon valley, Jonathan y Olivia Argentine Tango Workshop, Leslie Friedman Contemporary Dance Technique & Repertory, Megan Ivey Physical Comedy, The Lively Foundation on July 1, 2016 by Leslie.